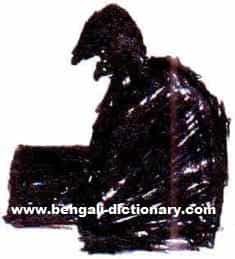 This is a thematically-arranged, bilingual English-Bengali dictionary. The choice of themes is random and it follows the fancy of the compiler rather than any definitive arrangement. For the non-native learners of Bengali it is possible to learn, very profitably, the rudiments of the language using the words and phrases of this dictionary and this standard Bengali study guide . For others, this compilation will serve the purpose of a general English-Bengali dictionary as well as a pronouncing dictionary of Bengali. For an explanation of the romanization scheme used in the dictionary, please click here. Moreover each word or phrase is followed by an audio icon ( ); click on it and the audio pronunciation will play automatically. This dictionary also contains illustrations. Wherever there is an image icon ( ), a pop-up window will appear on pointing your mouse to it. In order to view the image, you may need to allow pop-ups in your browser (IE, Google Chrome , Firefox , Safari ) for this site. I am indebted to Mr David Philips ( http://www.sil.org/) for extending his helping hand several times with his Indic Roman Keyboard and but for the SIL Converters, latin transcription of the Bengali text would have been a difficult task. To read Bengali, a Unicode Bengali font should be installed in your computer. Please follow these instructions to enable your computer to display the indic language characters. The Bengali text in this dictionary is best viewed with Bangla font. Please download the font and instal it in your "Fonts" folder. Please search the dictionary before sending your queries to me here for inclusion. The compiler will be pleased if users of this dictionary send their suggestions, appreciations, criticisms or comments to him. This is where you can write to me directly. Thank you! Copyright © 2006 by Subhamay Ray. All rights reserved.